The 4 member contingent at the NBL Draft Combine. From L to R- Amjyot Singh Gill, Vishesh Bhriguvanshi, Amritpal Singh and Yadwinder Singh. It was an unprecedented honour. In mid-April, four of the top players of India’s national basketball team – Amjyot Singh, Amritpal Singh, Vishesh Bhriguvanshi, and Yadwinder Singh – were invited to Melbourne to take part in Australia’s National Basketball League (NBL) Draft Combine. No Indian player has ever played in the NBL. 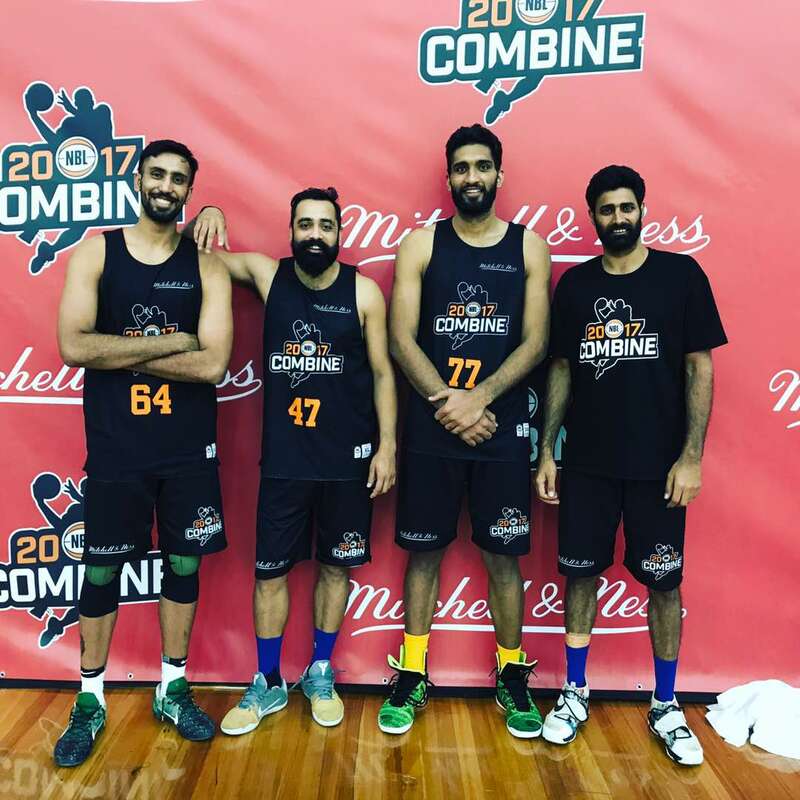 Amjyot, Amritpal, Bhriguvanshi, and Yadwinder – all of whom have helped India make rapid strides in improvement in recent years – were among a total of 80 players at the Combine at the Melbourne Sports and Aquatic on April 17-18 with hopes to cracking into the nation’s top professional basketball league. The Combine was an opportunity for coaches and scouts of different NBL teams to gauge the talent at hand and sign the players they believe could help their team. NBL teams are usually allowed only three spots for foreign players, but under the new rules, players belonging to the countries of the FIBA Asia zone will be given an additional separate spot. This could really encourage one of the NBL’s eight teams to sign one of the Indians. Amjyot Singh and Amritpal Singh are no stranger to foreign league attention. Both Punjabi big men have played professionally in Japan’s BJ Summer League and their Development League, winning the Japanese D-League title as teammates in the latter for the Tokyo Excellence. Last year, Amjyot and Amritpal also declared for the NBA’s D-League draft but were not picked. Bhriguvanshi is one of India’s most experienced and talented players and is recognised as one of the best shooting guards in Asia. The most experienced of India’s representatives in Australia was Yadwinder Singh. ‘Yadu’ (30) has been playing internationally for India for over a dozen years. The 6-foot-6 forward is known to be one of team’s most beloved players and has played crucial roles behind the “Big Three” of Amjyot, Amritpal, and Bhriguvanshi in India’s successful campaigns in the 2016 FIBA Asia Challenge and 2014 FIBA Asia Cup. Domestically, he plays for ONGC in Dehradun and most-recently represented the Haryana Gold squad in the UBA Basketball League. After he returned back to his home in Rasulpur near Amritsar in Punjab, I got an opportunity to interview Yadwinder about his experiences in Melbourne and his future plans. Q. How did you hear about the opportunity to take part in the NBL Draft Combine and what was your first reaction? Yadwinder: I was first told about the opportunity by Vishnu Ravi Shankar (the co-founder of Pursuit India) about three or four weeks before the Combine. Of course, I was very happy to hear this news. I know that I’m old – I’m over 30 now – and I was glad to still get this opportunity. Usually, foreign leagues are only interested in players under 25. I started practicing for it right away and I knew I had to do my best. This was my second time in Australia; I played for India at the 2006 Commonwealth Games in Melbourne. Q. How helpful was it that you had Amjyot, Amritpal, and Vishesh – three guys who you have spent so much time playing with internationally and domestically – by your side for this trip? Yadwinder: The four of us, we have a brotherhood. I was so happy that I was there with guys that I have played with so much. I play with Vishesh and Amrit in ONGC and with Amjyot in the national team. So it was a lot of fun. I would have been more anxious if I was there alone, but with all four of us, there was no pressure. We encouraged each other to play better. The trip was comfortable off the court, too. My sister lives in Melbourne, she has been in Australia for 10-11 years. She took care of everything for us and we had no problems getting around. Q. Tell me about the schedule of the Combine, and what types of workouts they had you guys go through? Yadwinder: We were registered on our first day with the other players. There were players mostly from Australia, but some from the USA, and some Canadians were also there. Several Chinese players were invited but they didn’t show up. They did a physical test first for our heights and weights, and then separated us all into different teams of about five or six. All of us four Indians were put into different teams. We took part in shuffle exercises, sprinting, jumping for our vertical, etc. on that first day. Then, after lunch, all of our teams played a few casual games. The next day, they called all of the teams back and told us a little bit more about the Combine. Then they tested our shooting percentages and I think we Indians were the best! All of us – Vishesh, Amjyot, Amritpal – shot really well. Amrit must have hit twelve or thirteen threes! There was one more game in the end before the closing. I really liked Melbourne, it’s a very good city. If I get the opportunity, I would enjoy playing there or anywhere in Australia. Q. What lessons from the Combine do you think you’ve picked up that will help you improve your game back in India? Yadwinder: We were there just for two days, so everything was a little rushed. But I know that that they stressed on the importance of playing in the team system, about how a new player can adjust in a team. It was also great playing with some of the other foreign players: I noticed their speed, their shooting ability, and definitely how their fitness-level was better than ours. We have to improve our fitness levels, too. Playing with a lot of those players, I think our confidence level improved a lot. I feel that I can play against anyone. Of course, Amjyot and Amritpal have proven themselves in the Japan. There’s nothing that we can’t achieve; if Indian players get a chance, we’ll give two hundred percent effort. Q. The FIBA Asia Cup is in August. How is the team preparing for it and what are the goals this time around after India made history at the FIBA Asia Challenge last year? Yadwinder: We are improving every day and doing our best. The national team camp will begin at the IG Stadium in New Delhi Day from May 1st. We are all in rhythm and have been playing a lot. I also heard that Satnam Singh will be joining us for the FIBA Asia Cup. Our team will be much stronger. The aim is to not to repeat the mistakes of the close games we lost in the past. We have to study where we fell short against teams like Iran and the Philippines and make improvements. We understand those teams better now. We watch a lot of our own games online and pay attention to our mistakes. We have to learn and improve. I’ll give you a personal example: say that I am on defence, guarding a player, and another player who is being guarded by Amritpal provides a screen. I get stuck in those situations, and I have to analyse how to squeeze out of that screen and recover to defend my man, and how Amritpal can recover quickly back to his man, too. Many of the offences in the international teams rely very heavily on screen-and-rolls and pick-and-rolls. That is something that I know I have to be in the lookout for on the defensive end. I want to give my team one hundred percent. Do whatever my team wants or needs from me. The coaches know where to use me on court and I would do whatever it takes. Between Satnam, Amrit, Amjyot, and Vishesh, we have a very good set of players in the team now. Q. What do you hope to achieve for the team and yourself over the next year? Yadwinder: We want to play even better and finish even higher in the FIBA Asia Cup. I’m not saying that we’ll get a medal, but we have to improve our standing. Every team rises slowly. The last time we played in a major tournament, there were problems with the Federation in India but we played well without a lot of good players. This time, we will have more high-level players available. Personally, I have to improve my shooting percentage. Of course, I always concentrate on defence, that’s my thing. We have enough good scorers in our team: Vishesh, Amritpal, Amjyot, and Palpreet [Singh Brar], who is now doing really well too. So I don’t have to worry about scoring; my focus is on defence.